Last week I published my second article on the throwing events in the UK publication Athletics Weekly. It focuses on the Karlstad Grand Prix event I featured last August and some of the innovative shot put formats I have mentioned before. Athletics Weekly is the best track and field print publication in the world and they have been a great supporter of the throwing events by publishing articles such as this one. Their magazine combines all the great analysis and insight you often see in Track and Field News with original coaching articles and in-depth profiles. In addition, it is much more timely since it arrives weekly. I subscribe to their great iPad app which lets me view each issue as soon as it comes out without waiting for international shipping. They have been kind enough to let me post the article here for non-subscribers, and a PDF version with the print layout is available after the text. 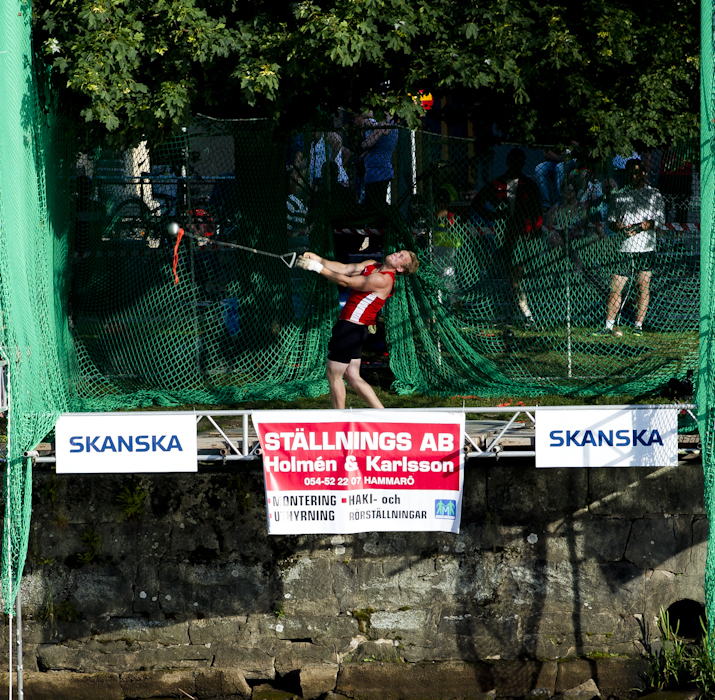 Hammer throwing over a river at the Skansa Open/Karlstad Grand Prix. Photo by Fredrik Karlsson. In previous years, the Skanska Open has featured throwing events, mainly the shot put, instead of burying them. Meet director Johan Engberg likes the promotional value of the throwing events and also the ability to prolong the exposure of athletics in the city. Despite organizing an entrance on race boats and the help of the Karlstad Divers Club to retrieve the shorter throws, Engberg found that the event was easier to host than the shot put in some ways. “The shot needed 40 tons of gravel in the sector,” Engberg explained. Sitting 300 kilometers to the east of Karlstad, Sweden’s capital, Stockholm, seems a world away. With 15 times the population of Karlstad, Stockholm plays hosts to DN Galan, the historic Diamond League meeting with a multi-million dollar budget. Starting in 2008, DN Galan featured the Big Shot, an elite and youth shot put competition at the downtown Kungstädgården Park. As in Karlstad, the Big Shot event is used as a promotion tool, but on a larger scale. Athletes are presented to fans on a grand stage and have their implement waiting for them on a red pillow. In its first year, approximately 1,000 spectators showed up and television producers packaged the event as a preview for the DN Galan by including interviews of the main event stars. The result was nationally broadcast to 400,000 viewers. Stockholm wasn’t the first to use the concept (the 2004 Athens Olympic Games, among others, took the shot put to ancient Olympia) and it won’t be the last. In the past few years, Söderberg has freely licensed the idea and the Big Shot name to international meetings in Zürich, Switzerland, and Hengelo, Netherlands. The Kansas Relays and Dakar international meetings have also used the concept. Despite the growing popularity of these throwing-only events, the situation is still not perfect for everyone. In Stockholm, Söderberg has heard some throwers say they miss being part of the main event and even larger crowds, even if they have to compete for attention with runners and jumpers. The meet has special to commemorate the Olympic Stadium’s 100-year anniversary and is considering moving the shot put back in the stadium for the historic event.